We are seeking a qualified assistant for part-time work for an immediate hire. We’re a dynamic and fun orthodontic practice located in Sierra Madre and Claremont. A radiating, positive attitude is a must! Please email a resume and your current contact information to recruitment.wuorthodontics@gmail.com for consideration. We look forward to meeting you! Message: Externship dental assistant positions available at our Brea and Tustin location. Contact Lisa for immediate start. Dental Facility: Dr. Mark H. Chang, D.D.S. Message: Seeking bilingual dental assistant, part time – full time. Excellent pay. 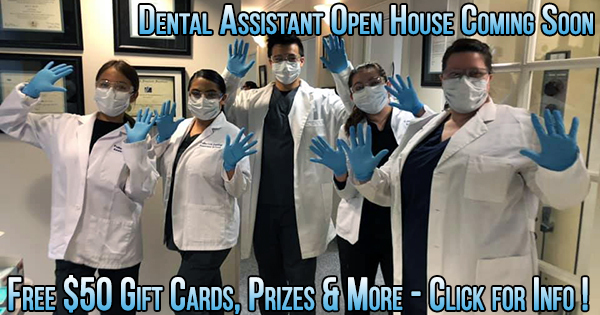 Join us at a Dental Assisting Open House and take the first steps to a new exciting career as a dental assistant. You will also have a chance to enter to win Free $50 Gift Cards, $25 gift cards, three $100 tuition discount coupons, and more prizes at the OPEN HOUSE CELEBRATION! This event will be held on May 3 at 5pm at 2720 North Harbor Blvd, Suite 110 Fullerton, CA. We will also have a drawing for Movie Tickets, a Starbucks gift card, and Teeth whitening tray. Free food and refreshments will be provided. The Fullerton Dental Assistant School has all the courses you need to become a dental assistant or RDA in one place. So please invite anyone you know who might be interested in becoming a dental assistant or an RDA. All you need to do is RSVP by contacting us via email or phone: (714) 882-5518 ! Space is limited so hurry today! Contact Name: Henry Hoang & Jessica Duong, DDS, Inc. Dental Facility: Wang and Jean DMD Inc. Message: Searching for a dental assistant. Front office skills highly desired. Front office duties (answering phone calls, verifying insurance, scheduling patients). Start up office, located in Buena Park.